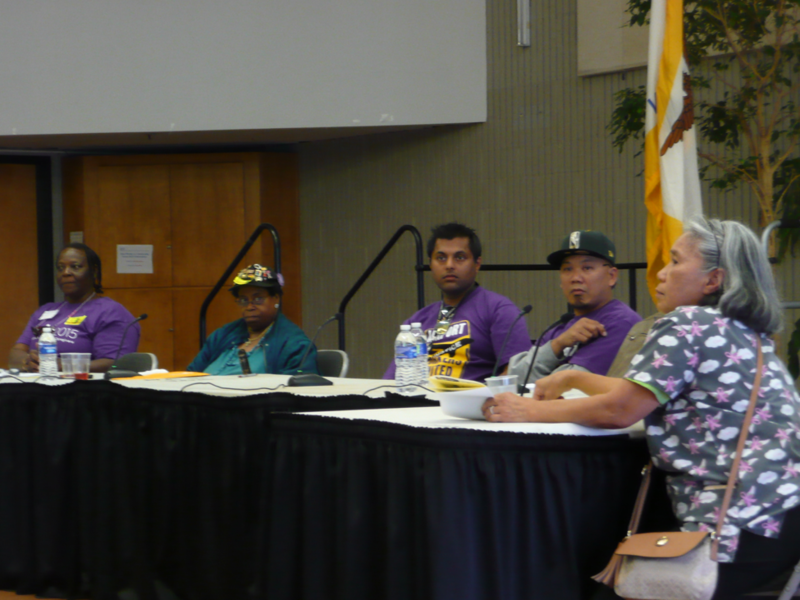 Low-wage workers gathered in a town hall meeting in Bayview on June 29th to denounce the growing income inequality in the Bay Area and declare that if their wages did not increase they would be forced to leave their jobs. Panel members listen as audience member Marilyn Tubao, shares her experiences as a homecare provider. Panel members from left to right Stacey Curtis, Vernell Hawkins, Kevin Prasad, and Arnold Paran. “The inequality in wages is ridiculous. The wage gap is getting bigger and for this part of the workforce, we aren’t getting anywhere. Something has to give” said Stacey Curtis, a homecare provider who administers vital care to the elderly and infirm so that they can live independently in their homes. The workers were meeting to discuss proposed amendments to the Minimum Compensation Ordinance. The amendments would increase wages for approximately 25,000 low-wage workers, including homecare providers, airport workers, and CalWORKs participants to $15.86 per hour in 2017, and $16.86 per hour by 2018. The Minimum Compensation Ordinance is different than the Minimum Wage Ordinance and has traditionally been slightly higher. All workers in San Francisco are subject to the Minimum Wage Ordinance, whereas the Minimum Compensation Ordinance applies primarily to the set of workers who are employed by businesses and organizations that have contracts with the City or lease property at the airport. The event was organized by the San Francisco Living Wage Coalition, the San Francisco Labor Council, and Jobs with Justice SF to provide a platform for workers to call upon their District Supervisors to support the proposed amendments. Vernell Hawkins, an executive board member of the San Francisco Labor Council and Bayview resident, explained some of the key details of the proposed amendments and urged lawmakers to support them saying, “There is no better investment than investing in the people who do the hard work taking care of our elderly and disabled, mentoring our youth, counseling families, caring for our homeless and serving our city. It is the right thing to do.” Hawkins went on to say that the increased wages for homecare providers is personally meaningful for her due to the fantastic care her mother received from a homecare provider for more than eight years after being given only six months to live. Karl Kramer, campaign co-director of the San Francisco Living Wage Coalition, offered a brief overview of the current economic conditions that make an increase in wages so vital. Kramer cited the fact that the median rent for a studio apartment in Bayview has increased from $2,005 per month in 2013 to $3,755 per month in 2017. While San Francisco’s minimum wage increased to $14 per hour on July 1, this raise is still insufficient for low-wage earners to keep up with the skyrocketing cost-of-living in the Bay Area. As a result, low-wage workers are being forced to relocate to the Central Valley which is causing a catastrophic labor shortage and retention problem in vital sections of the job market. According to Kramer, this retention problem is leading to the loss of experienced workers which in turn will lead to a decline in the quality of services these workers provide to the residents and visitors of San Francisco. Kramer argued that these issues have to be addressed through laws like the proposed amendments that raise wages in order to help low-wage workers continue to live and participate in the Bay Area job market. Several audience members who are currently employed in low-wage jobs that would be helped by the proposed amendments shared their stories and emphasized that the current minimum wage was not enough to make ends meet. Workers reported needing to commute long distances from the Central Valley, being forced to make tradeoffs that sacrificed their ability to participate in family life in order to work extra hours to cover living expenses, noticing an issue with high turnover rates at the places they work, and needing their children to take jobs in order to remain in their home. When asked if an increase of $1.86 per hour would help alleviate some of these problems, the panel of assembled workers agreed that an increase wouldn’t make the problems go away, but was a necessary first step in the right direction. The proposed amendments are currently still pending approval from the Budget and Finance Committee before the Board of Supervisors can ultimately vote on them. Bayview’s District Supervisor Malia Cohen is the Chair of the Committee and has yet to publicly support or oppose the amendments.